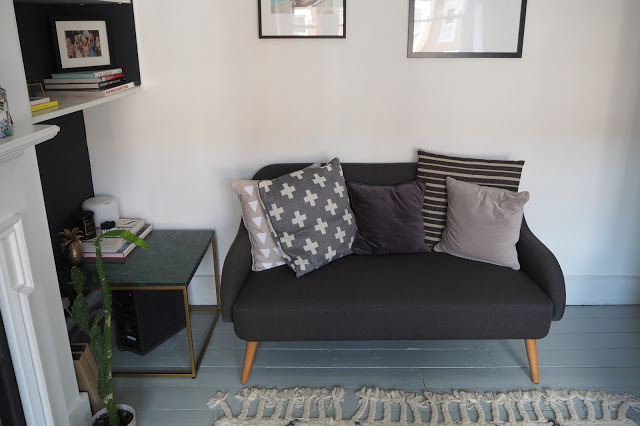 Sofa: £350 in the sale, Habitat. It’s funny, we’ve lived in our flat so long now and were just ‘making do’ with the existing style, I had almost assumed our living room was finished. Until it actually was. And we feel so liberated. 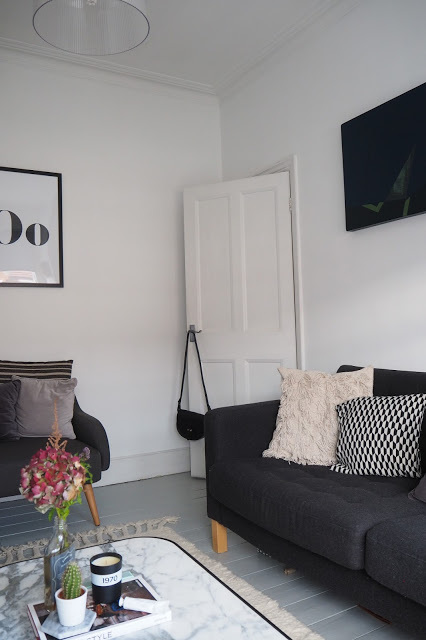 I’m not saying we did a complete overhaul or anything – the room was already fine as it was, we just finally pulled up the yellowy carpets and introduced a more neutral colour palette. Besides paint, blinds and furniture, there weren’t really many costs – just our labour (I say ‘our’ but my husband did most of the work). I would really recommend trying to make your old floorboards work. Ours weren’t in the best condition but sanding them down and painting made such a difference, and we knew we were just going to throw a big rug over the floors anyway so we can get away with them not being pristine. They make the room so much more airy. 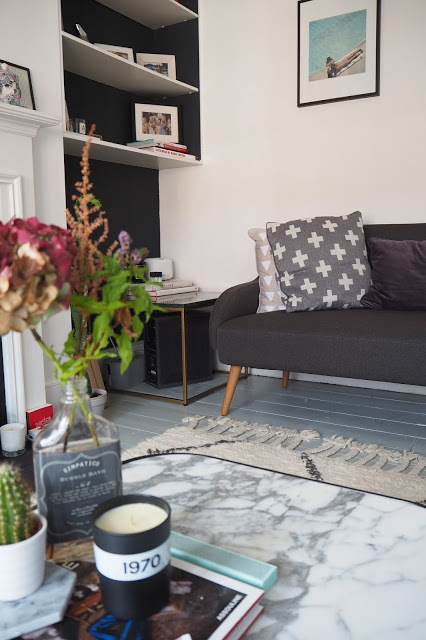 We went with the West Elm Souk rug in the end, I’d wanted it for years and felt it had a more authentic feel than the La Redoute one for us (even though the La Redoute one is great value!). 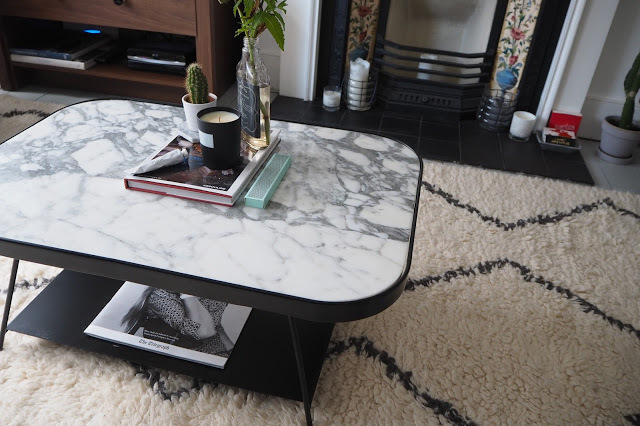 And we went with a marble coffee table from La Redoute (which I sadly can’t find online anymore – will update when I can). Cactus: £4.50 for set of 3, Ikea. Marble coaster: Granit. 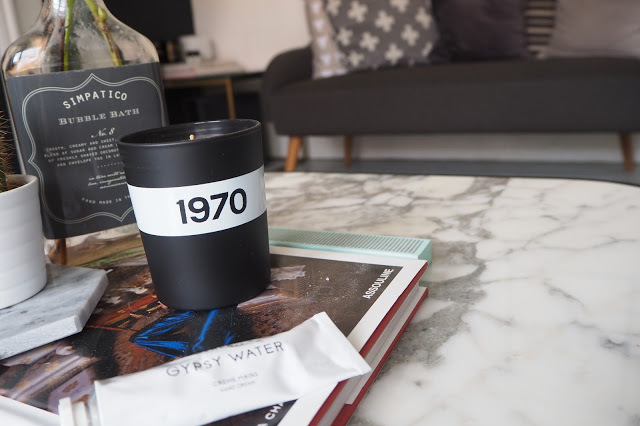 Candle: £40, Bella Freud. 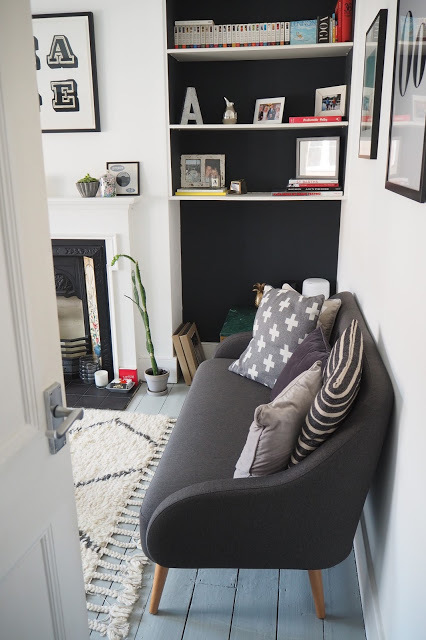 Our Ikea sofa was the best buy we made when we moved in – it was £450 and looks so much more expensive (I think!). It’s grey flannel wool and is so easy to keep clean – a lint roller brings everything up beautifully! Like most nesters, I’m a cushion lover. 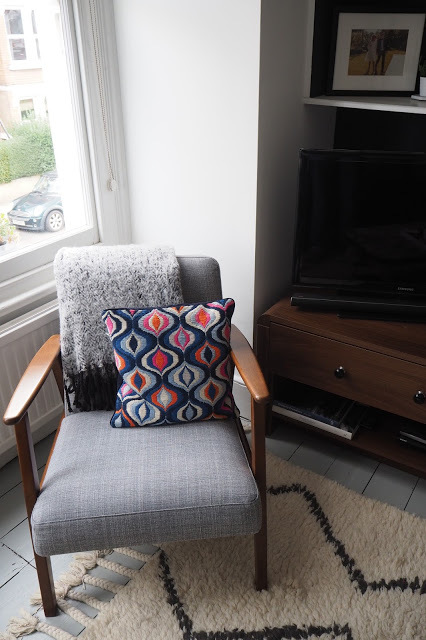 In this room I’ve gone mainly neutrals and these cushion covers are from H&M Home and Etsy. 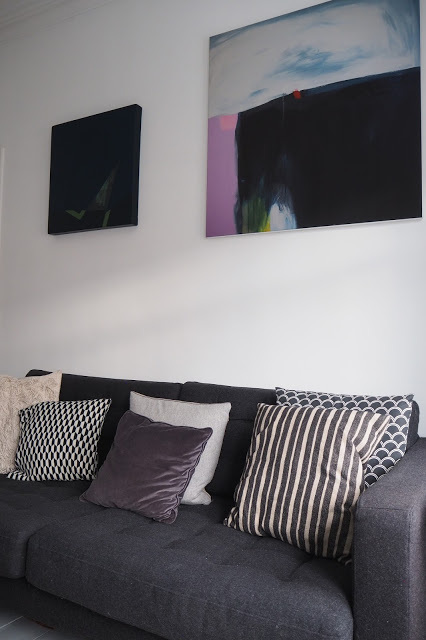 Luckily the sofa has room underneath for storage too – we keep all cables, wrapping stuff and even a flatpack chair under there for guests! Table: bought to use at our wedding from Achica and re-used at home. 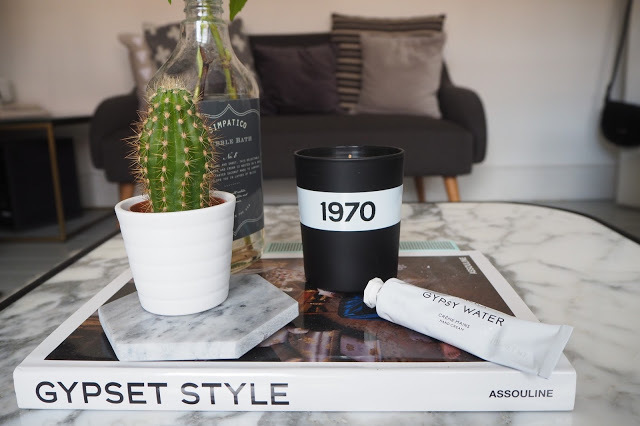 Concrete plant pot: £6-£8, Monpote. Plant: £4.50, Ikea. All the art in our home has been collected over time, either from Etsy, the Other Art Fair, our travels or gifts from friends. This painting of 2 eggs was a wedding gift from friends – Lou and Theo (Theo Platt is a talented artist based in Harpendon). We were really lucky with our lot really, the fireplace was already here, along with original sash windows (we just have grey blinds up from Debenhams). As was the shelving, we just painted behind with Farrow & Ball ‘Railings’, we definitely bought the house based on a lot of its period features so were keen on keeping them. 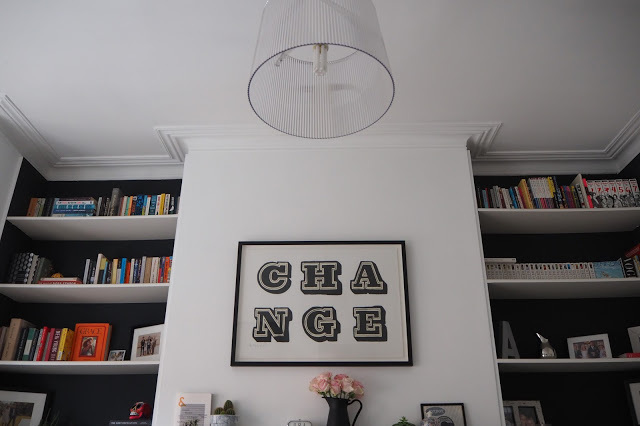 The ‘Change’ print was one of the first items I bought myself for our flat. I absolutely love it. 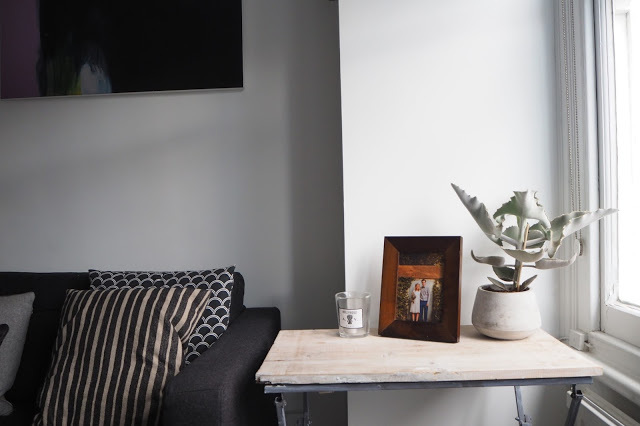 Most trinkets, vases etc are from either Ikea, H&M Home or West Elm – I honestly don’t believe everything in your home has to be expensive to look expensive. 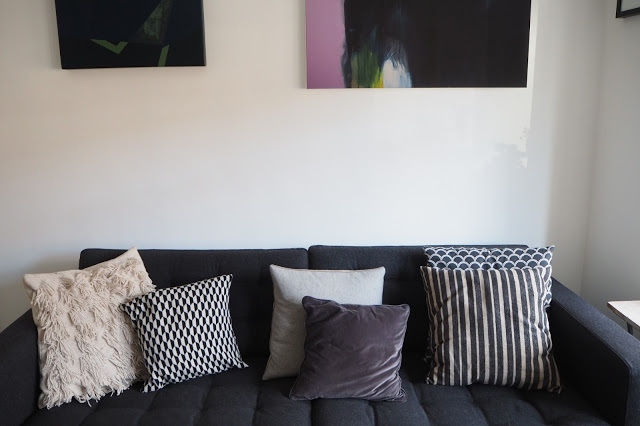 My sister is a great Ikea buyer and I have learnt a lot from her (see her amazing home here). I love candles. They make me happy, and most friends and family have realised now it is far easier to buy me a candle for birthdays, Christmas etc, rather than clothes. My mum bought me this Cowshed candle last Christmas. But I must admit to being scared to light it so as not to waste it (! ), so I always have cheap church candles from Tiger in my fireplace for ambience. 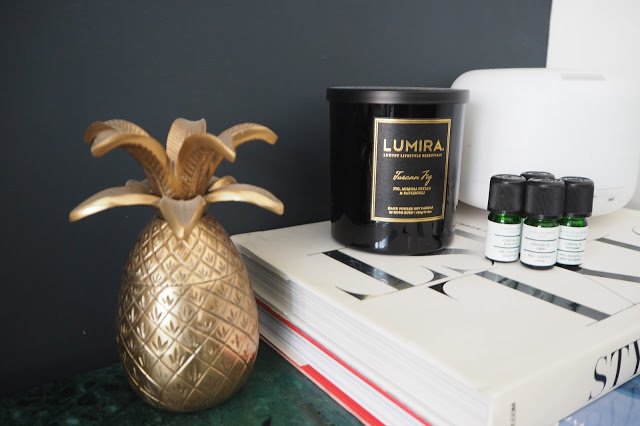 My husband is also obsessed with our Muji aroma diffuser – the actual vessel is probably not the chicest but the eucalyptus oil smells amazing. Once a candle is gone, i will re-use the container for tea lights or pen holders or a plan pot. 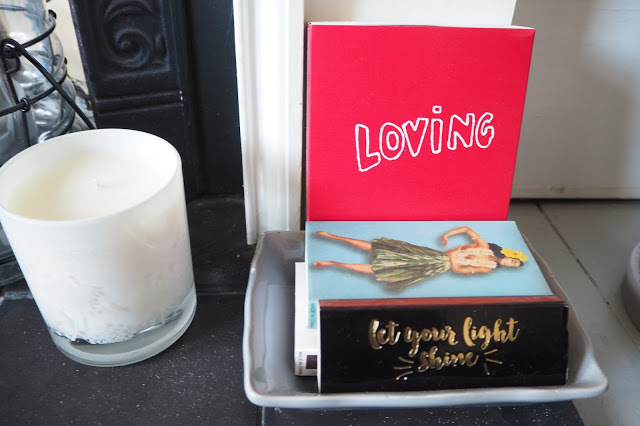 I also collect matches, I love buying long matches from my travels, and always take free matches from pubs, restaurants (and Dean Street Townhouse – I swear they move them when I walk in!). DO look for plants in unusual places – some of my best plant/cactus buys have been in Lidl, Ikea etc. 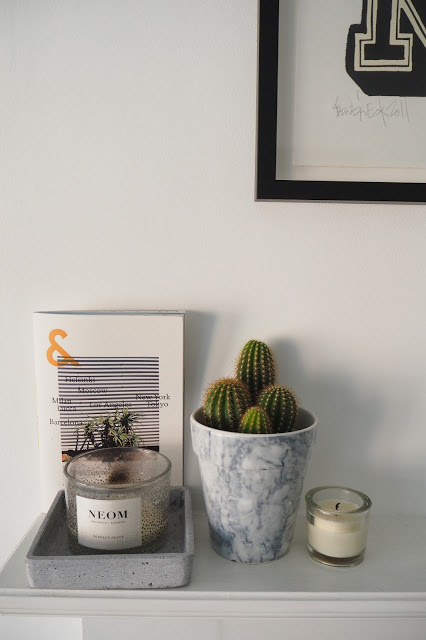 If you ever go to Sweden, try and find out if there is a Granit store there, it’s my favourite place for interiors knick knacks – concrete planters for £6, marble coasters for £2 etc…just make sure you have enough hand luggage space (see my post on Granit in Gothenberg, here). I also love Fishs Eddy in NYC for crockery – they have a small selection in Liberty but nothing like the store near in the Flat Iron district, New York – it’s always on my shopping list when I go. 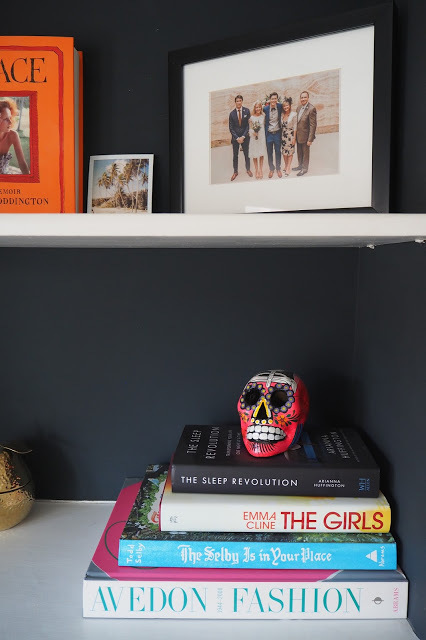 The neon skull was bought in San Diego on a trip – I love the pop of colour. I love the punch of colour that Jonathan Adler brings to a room. I have his ‘Tokyo’ cushion too, which I love. I usually buy from NYC when I go as it’s pretty much the same price in dollars, but they have a good selection on Amara, as well. Jeans: £30, Asos. 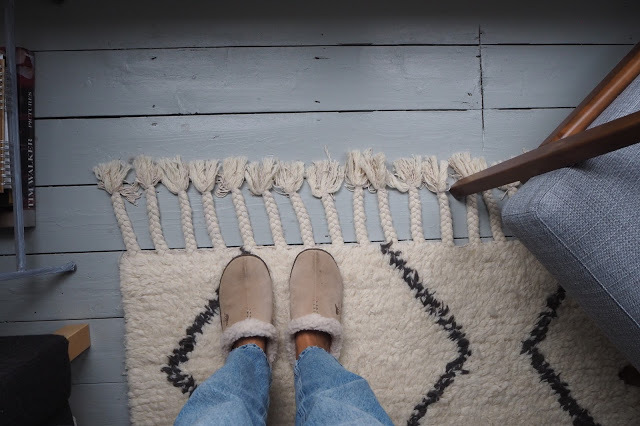 Sheepskin slippers: £50, Sorel. Souk rug: West Elm. 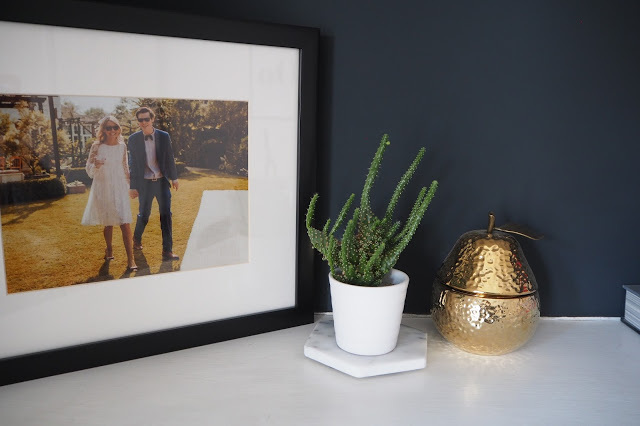 As much as I don’t like clutter, I do believe in keeping memories around the flat. 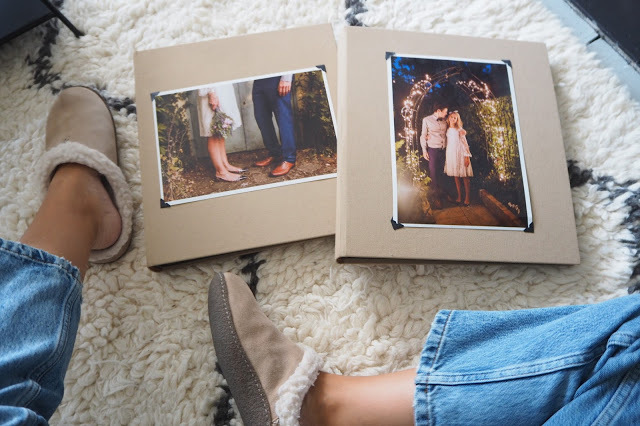 These are our wedding albums, which I put together myself with Paperchase bound books. 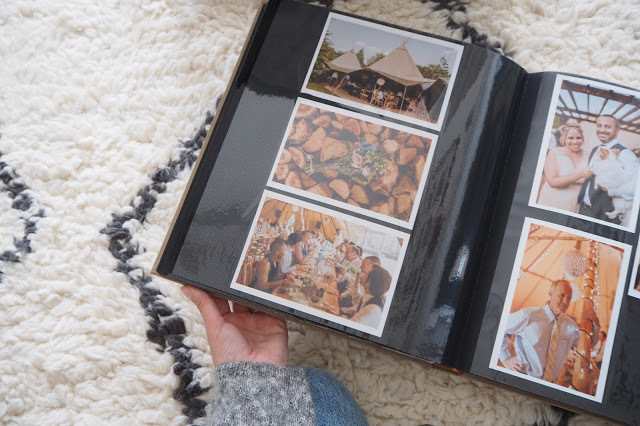 I always make sure I print my photos and organise them in albums – I’m a traditional paper lover and enjoy flicking through. Oh and the grey box to the right is one of those boxes from Ikea where you can hide unsightly extension cords and plugs – I’m addicted! 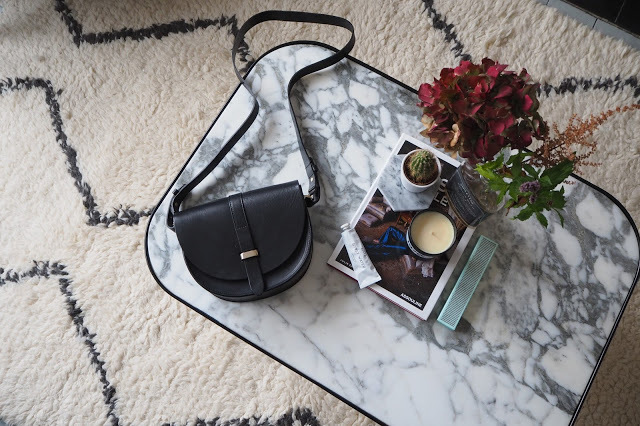 Leather bag: £155, Sezane. Cactus: £4.50 for set of 3, Ikea. Green matches box: £4, Hay (bought in Copenhagen but you can buy from Amara here). 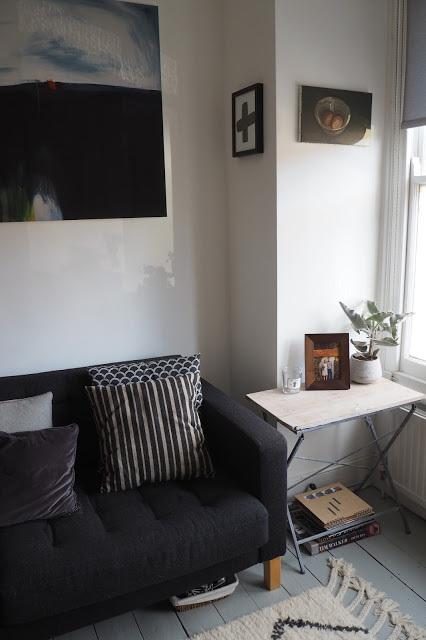 We’ve ordered 4 coffee tables for this space now, and, because we’ve gone so long without a table, everything has felt too large or bulky or overpowering and we returned them. 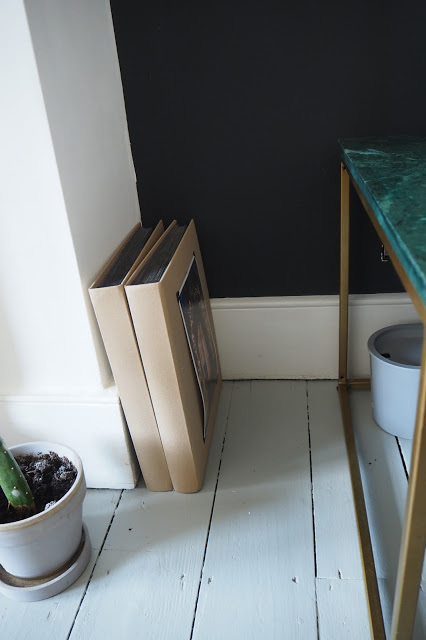 This coffee table was our last chance really, and it’s perfect. Not too big, rounded corners, not too low, but also a bit of storage underneath to put stuff I’m working on or planning to read. It’s also the only one my husband could agree on, plus there was 40% off when we ordered it so it made everything a little easier. 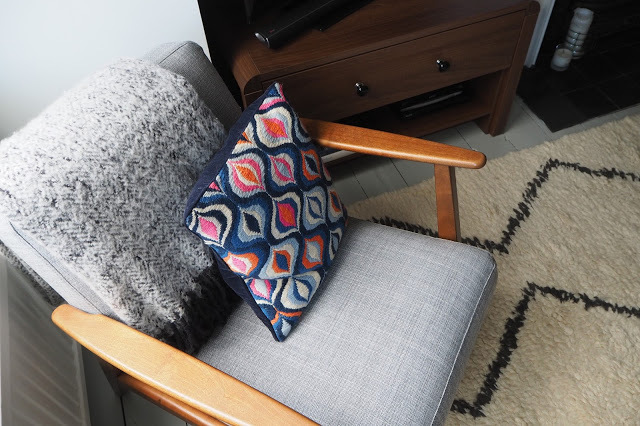 Now, I honestly don’t know what I did before – actually that’s a lie, I spilt coffee ALL the time on the floor when resting it on the carpets – thank goodness we’ve got wooden floors now. 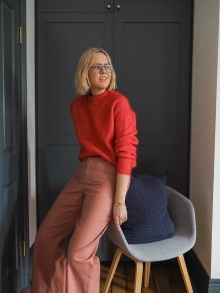 So I know it’s not exactly ground-breaking decor, but hope it helps to realise you don’t always need a Hay budget to do a minimal style in your home, and it’s about choosing the right bits to invest in for you – it definitely doesn’t have to all be designer. I don't see any lamps. What do you do for light? 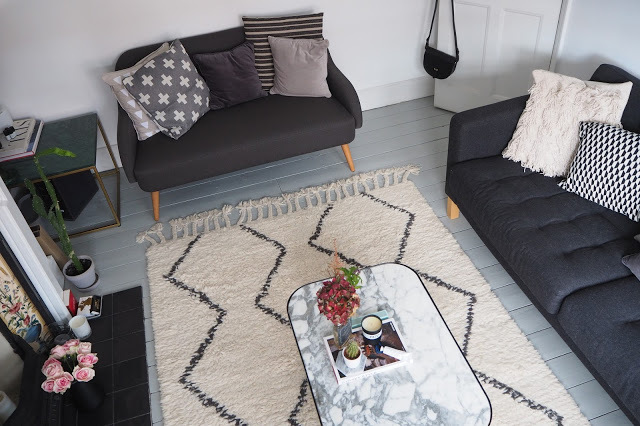 Not normally a fan of Habitat but that sofa has got me wanting to shop! 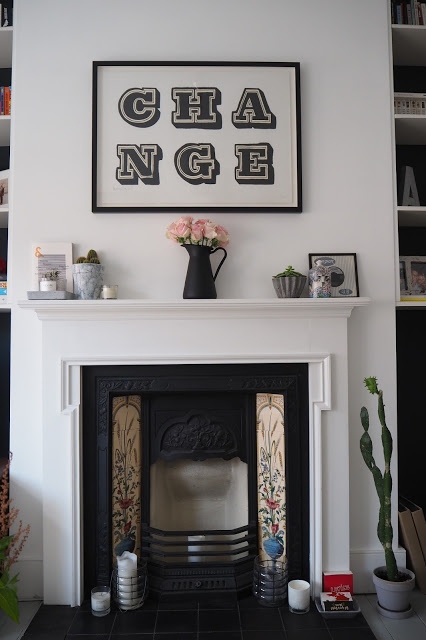 Love your fire place tiles also! What a beautiful, thoughtfully designed room. I am so averse to 'stuff' but this shows how to do it just right. 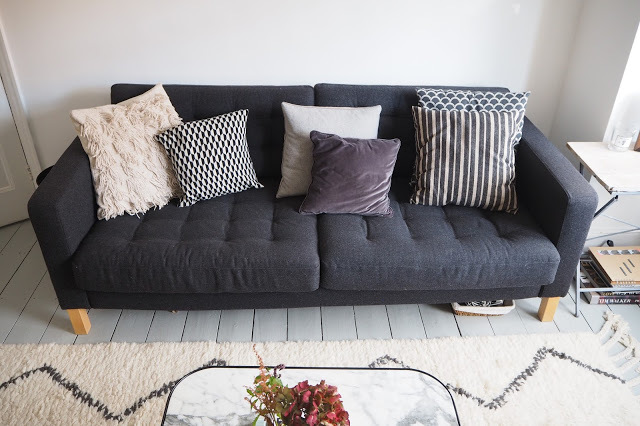 I love the way you've done your living room – chic but achievable. Grey tones with little pops of colour is such an elegant colour scheme. Hey Alex, is the Ikea armchair comfy? We’re thinking of getting a couple for our living room, as they’re quite reasonable and more importantly seem to be quite compact! Love, love, love that couch! Ikea definitely helps keep the decor budget in check. I haven't been there in a while so it's nice to see some of their selections. Beautiful room. Really love the painted floor look and want the same for our spare bedrooms but our floor guy is trying to dissuade is from it as he said it will chip. Do you find that your painted floors are prone to chippage?